A rich, creamy mugali mushroom curry best goes with rumali roti, nan or laccha paratha. 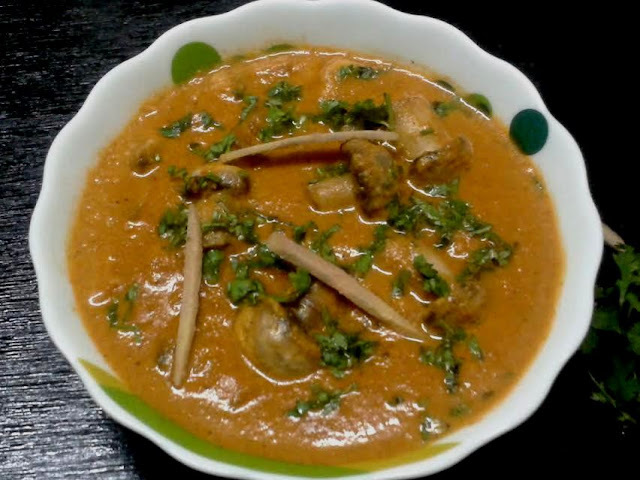 it's prepared with onion, tomato, khoya and cream along with dry spices and whole spices. Mugali cuisine often involves cashew nuts or almonds with malai which gives it a rich nature and really delicious. 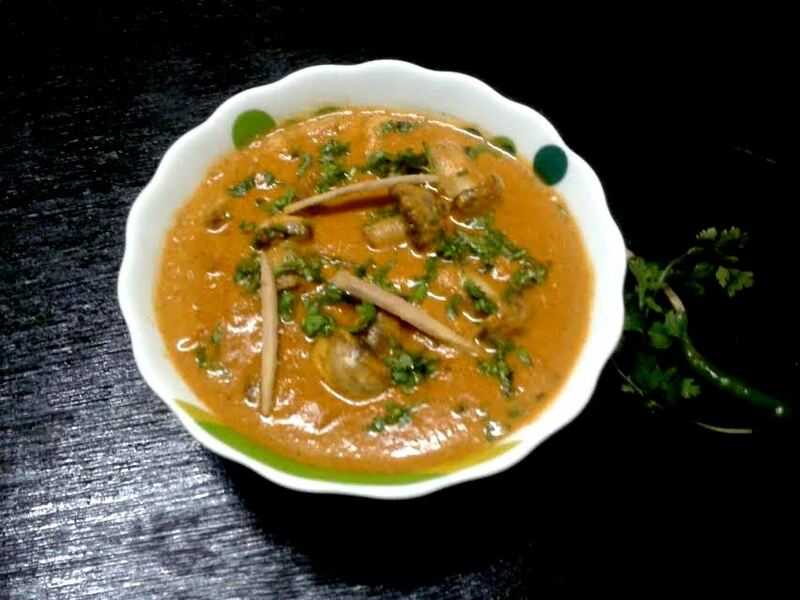 Though there are variety of dishes that can be prepared using mushroom but here I have used it to make muglai mushroom, for the first time I have prepared this dish and it turned out to be delicious. अब इसी बर्तन में १ चम्मच घी और डालें पहले प्याज़ को हल्का भूनें और फिर हरी मिर्च, लाल मिर्च पाउडर, धनिया पाउडर, काजू, खरबूजे के बीज, दालचीनी, लौंग और इलाइची साथ ही १ कप पानी डालकर मिश्रण को टमाटर के मुलायम हो जाने तक पका लें. मिश्रण के ठंडा होने पर इसमें से दालचीनी, लौंग और इलाइची को निकाल कर मिक्स में महीन प्यूरी बना लें. अब एक पैन में घी गरम करें अदरक, लहसुन की पेस्ट को भून कर प्यूरी, खोया और नमक डालकर कम से कम ५ मिनट के लिए पका लें. धनिया पत्ती और अदरक से सजा कर चपाती, रुमाली रोटी, या पराठे के साथ परोसें. Chopped tomatoes 1 large no. Green cardamom 4 nos . 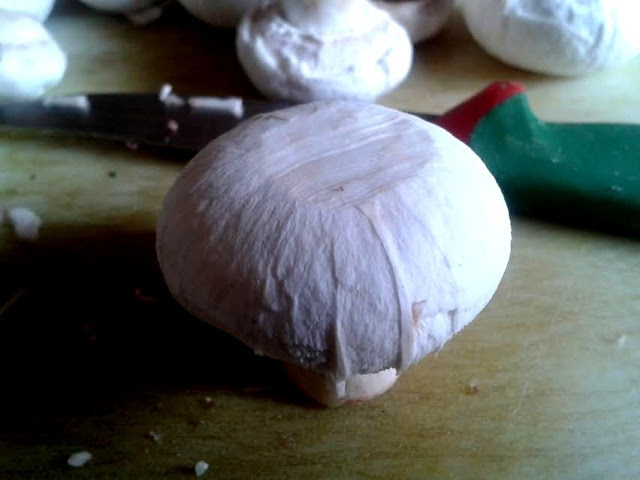 Wash and peel the mushrooms, then cut them into half. Heat 1 tbsp ghee in a pan and saute the mushroom till light golden. Remove from the pan and keep aside. Add 1 tbsp ghee in the same pan, add onion and stir 2 minutes. Add green chili, tomato, red chili powder, coriander powder, cardamom, cinnamon, clove, melon seeds and cashew nut and 1 cup water saute till the tomatoes become soft. Once the mixture get cool down discard the whole spices then add the mixture into the blender and make a smooth puree. Heat 1 tbsp ghee in a pan saute the ginger garlic paste, then add the puree, khoya, salt and cook it for 5 minutes on medium hot flame. Add fresh cream, and mushroom and cook it for few more minutes and switch off the flame. add crushed kasoori methi powder mix well. Garnish with coriander leaves, serve hot with rumali roti, nan, parantha or steamed rice.